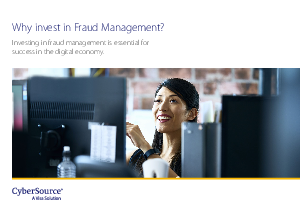 > CyberSource EMEA > Why invest in Fraud Management? The digital economy is dramatically changing how consumers shop and interact with businesses. They expect a fast, convenient and highly secure digital experience. With the average company lifespan decreasing rapidly, merchants have to operate as a true digital enterprise to stay competitive and to stay in business. Payment and fraud management is no longer a back-office utility. It is a prime differentiator, critical to achieving competitive advantage, improving customer experience and reducing risk. Digital transformation is not simply a market buzz word. It is real. And those who don’t embrace it are in a position to lose. By 2020, eCommerce sales as a percentage of retail sales are forecast to be 12.4% compared to 8.0% in 2016, according to eMarketer. And engaging customers digitally across channels remains a top digital initiative. While there are several drivers of growth in the digital economy, none are more significant than the force of mobile and cloud technologies. Innovations like these are also contributing to an environment that poses new security challenges. Whilst helping you to capitalise on sales opportunities, if not managed closely they can quickly undermine your business integrity and threaten your customers’ confidence. Overall, the growth in digital channels is increasingly enabling delivery of integrated consumer experiences across multiple touchpoints. These capabilities lay the foundation platform for an invisible/frictionless payment experience and create a common payment experience across channels of interaction.